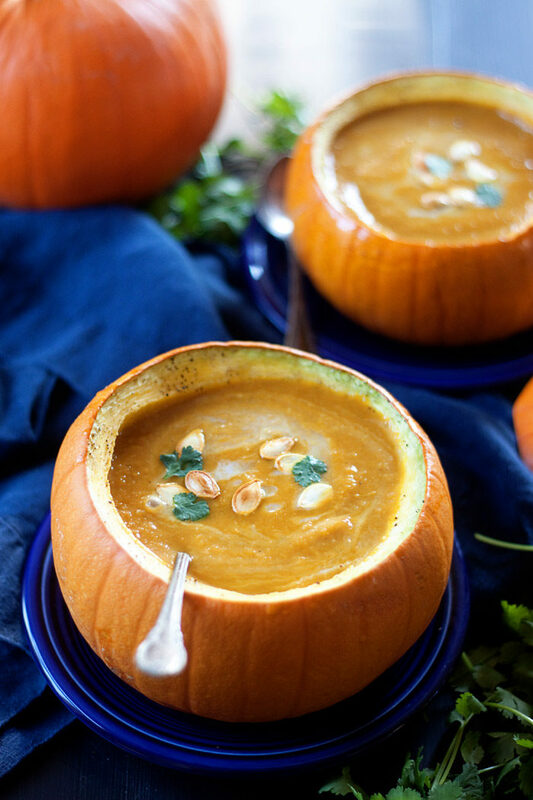 Pumpkin puree, apples, onions, and warm, earthy spices are blended together to create a pot of creamy, delicious pumpkin love! 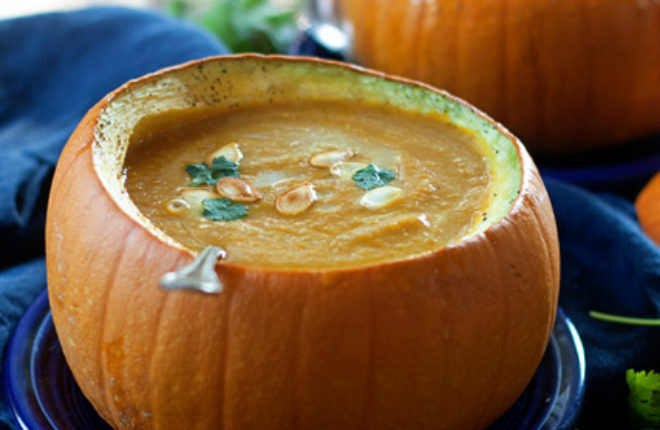 This one is made with pumpkin puree, so you can enjoy it any time of year – not just fall. 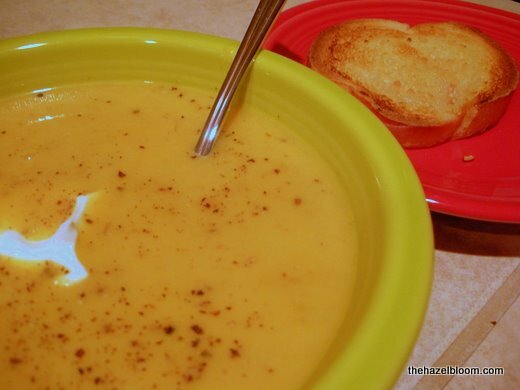 This Pumpkin Curry Soup recipe was one of the very first I ever blogged – all the way back in 2009. With a photo like this, it’s been a wee bit embarrassing to have it out there on the blog. Yeah, not my best work! So I thought I’d revisit this wonderful (and easy!) little recipe, take some new pictures, and share it again here today. I’ve also added some new dairy-free/vegan options. Happy Pumpkin Season! Mmm, pumpkin. I’m obsessed with pumpkin right now. 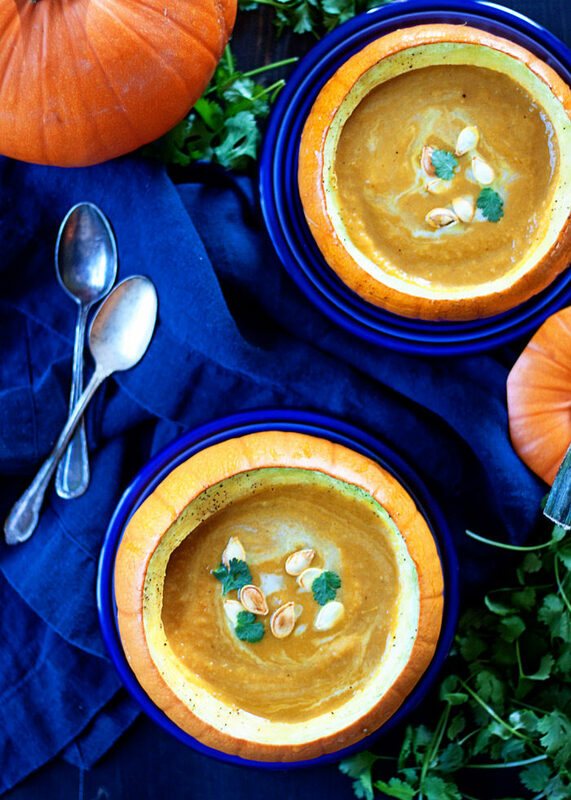 Last Sunday, a good friend (who is also obsessed with pumpkin right now) came over to spend an evening experimenting with pumpkin recipes – low fat pumpkin recipes. My friend is very health-conscious, and while I applaud her and am so proud of her, I am sadly so not there right now. First of the year, first of the year, first of the year. Then I’ll be there, dangit! Curry and pumpkin were born to be together, I’m pretty sure. And something magical happens when you throw celery, apple, and honey into the mix. Something very magical. Just try this. You’ll understand. P.S. 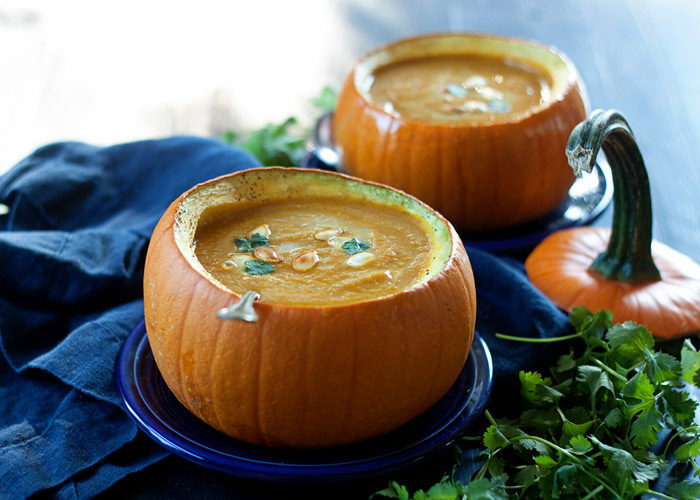 : If you’re making your own pumpkin puree for this pumpkin curry soup, for the love of all that is holy, please save the seeds and roast them! 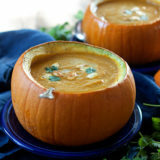 For my new 2016 version, I thought I’d serve this soup up in pumpkin bowls. So easy! If you want to try it too, I’ve added instructions to the recipe. First published November 9, 2009. Updated October 8, 2016. Place a large pot over medium heat. Add the butter or oil. When melted (or hot), add the onion, celery, and apple. Saute at medium heat until onion is translucent and beginning to brown, about 10 minutes. Add the curry powder and cook, stirring frequently, for another couple of minutes. Enjoy how yummy your kitchen is smelling. Add one cup of the vegetable broth. Remove from heat and let cool a bit until it’s safe to handle. 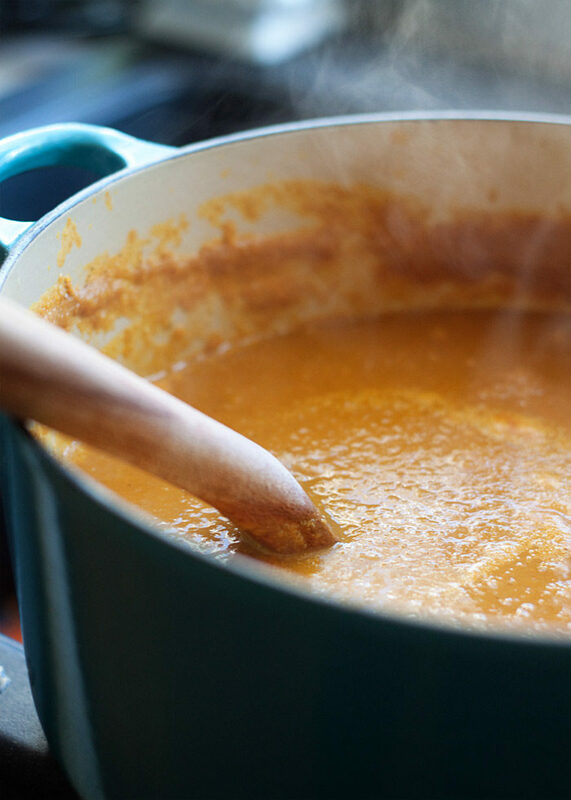 Puree until smooth by using either an immersion blender right in the pot or a blender. Add pumpkin and blend again until smooth. Return to the pot. Add the remaining broth, salt, pepper, and the bay leaf. Return to medium heat. Cook, stirring occasionally, until the soup returns to a boil. Reduce heat and simmer for 5-10 minutes, stirring frequently. Add the honey (or pure maple syrup) and the heavy cream (or coconut milk). Bring back to a simmer and cook for another couple of minutes, stirring frequently. Taste and add additional salt and pepper if desired. Serve. Use olive oil instead of butter; coconut milk instead of heavy whipping cream; and pure maple syrup instead of honey. Choose small-ish sugar pumpkins or pie pumpkins (also sometimes called sugar pie pumpkins). Heat oven to 350 degrees Fahrenheit. Line a rimmed cookie sheet with parchment paper or foil. Using a sharp knife, cut off the top of the pumpkin. With a spoon, scoop out the guts of the pumpkin. 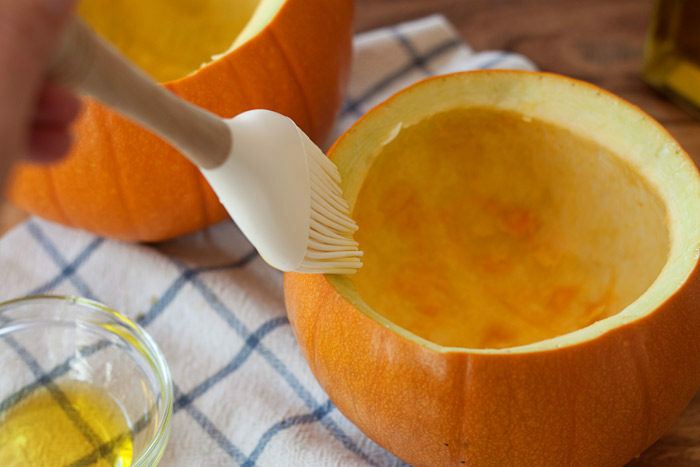 Brush the pumpkin with olive oil and sprinkle with salt and pepper. Set the pumpkin upside down (cut side down) on the cookie sheet and bake until fork-tender, 25-40 minutes (cooking time varies greatly depending on the size of your pumpkin). Kare, i’m loving your blog! And BECAUSE we had healthier, low-fat dessert options, we were able to indulge in a cup of this YUMMY soup! And fyi – I plugged the recipe into the nutrition calculator I like and it wasn’t awful, just depends on what you serve next to it!! I will be making this again! Great idea for cold days dinner ! Great photos too ! Thank you !